Bostock New Zealand owner John Bostock is challenging other growers and landowners along the Karamū Stream to help clean it up. Mr Bostock who operates four orchards running along the Karamū stream, says it’s time for landowners and community groups to take action and help clean up the stream, so he has started the Bostock New Zealand Karamū Restoration Project. “We have committed to fencing and voluntary planting almost 1 kilometre of the stream. We need to take ownership of different areas of the Karamū stream and work together to restore this beautiful waterway. If we are all paddling in the right direction we can achieve a clean, freshwater stream which we are all proud of. Mr Bostock is working with Hawke’s Bay Regional Council and is paying for all the fencing costs along the stretch of land owned by the council. The Regional Council is paying for some of the native plants. “With our Karamū Restoration Project, we are focusing on planting native species that will shade the stream and lower the water temperature for the habitat. It will also keep stock away,” said Mr Bostock. Bostock New Zealand is planting a variety of natives including Kakatea, Totara, Manuka, Cabbage Trees and Miro. Hawke’s Bay Regional Council Chair Rex Graham says it’s wonderful to see companies like Bostock New Zealand helping to turn the state of the Karamū Stream around. Mr Graham says within the decade he hopes that the entire Karamū Stream will be planted. 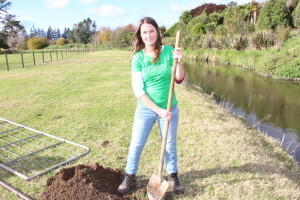 Bostock New Zealand has organised its first native planting day along the Karamū Stream on Sunday 17 June. “Bostock New Zealand staff, families and friends are volunteering to plant the stretch of stream in their own time to show their commitment to making Hawkes Bay a better place,” said Mr Bostock. Bostock New Zealand is also encouraging the public to bring their spades and join the planting fun.